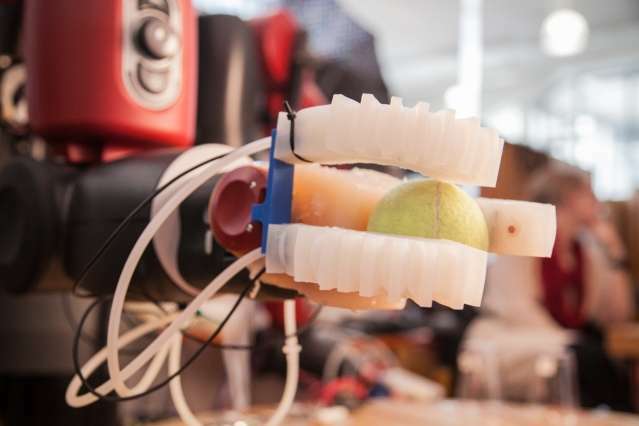 Soft robots are in focus at MIT. They are built from non-traditional materials like paper and synthetic fiber. Brooks Hays reported on their work for UPI on Wednesday. Soft robots matter. If we are to enjoy potential applications for robots that can grasp, hold, and manipulate objects without dropping or crushing them, then the engineers at MIT's Computer Science and Artificial Intelligence Laboratory (CSAIL) potentially have much to contribute. At MIT, they are looking into, well, robots that can turn to the more delicate responsibility of handling eggs without dropping and smashing them. Engineers at MIT's CSAIL have built a new robot that has a hand with three fingers, made out of silicone rubber. This is a robotic gripper with special sensors and it can estimate the size and shape of an object accurately enough to identify it from a set of multiple items. Adam Conner-Simons reported in MIT News on Wednesday that researchers have demonstrated the 3-D-printed robotic hand made out of silicone rubber, which can lift and handle objects as delicate as an egg and as thin as a compact disc. "Just as impressively," he said, "its three fingers have special sensors that can estimate the size and shape of an object accurately enough to identify it from a set of multiple items." A video shows the gripper holding items such as disk, cube, coffee cup, little soft, stuffed animal toy, and other objects. One can see success in holding various shapes, sizes and textures. Robots are often limited in what they can do because of how hard it is to interact with objects of different sizes and materials," CSAIL Director Daniela Rus said. "Grasping is an important step in being able to do useful tasks; with this work we set out to develop both the soft hands and the supporting control and planning systems that make dynamic grasping possible." At the core of their technology are their "bend sensors," said Conner-Simons. "When the gripper hones in an object, the fingers send back location data based on their curvature. Using this data, the robot can pick up an unknown object and compare it to the existing clusters of data points that represent past objects." With just three data points from a single grasp, algorithms distinguish between objects. Bianca S. Homberg, Robert K. Katzschmann, Mehmet R. Dogar, and Daniela Rus, team members for the soft robotic hand, authored the paper, "Haptic Identification of Objects using a Modular Soft Robotic Gripper," where they discuss the hand and how it works. The authors wrote that "With the integrated bend sensors – one data point from each of the three fingers– our robot is able to identify a set of canonical objects of different shape, size and compliance by grasping them. We do this by building a relation between objects and the configurations the soft hand takes while grasping them. Then, given an unidentified object from our training set, our robot grasps it and uses proprioception to identify it. Through experiments we show that our hand can successfully distinguish between objects up to the resolution limit of the proprioceptive sensors." Researchers control the gripper via pistons, pushing pressurized air through the fingers. The pistons cause bubbles to expand in the fingers, spurring them to stretch and bend. The robotic hand can hold objects using "enveloping grasps," where the object is entirely contained within the gripper, and "pinch grasps," where the object is held by the tips of the fingers. As for materials used, silicone rubber was chosen, and the MIT News report spelled out why. The fingers were made of silicone rubber because of it being "relatively stiff, but also flexible enough to expand with the pressure from the pistons. Meanwhile, the gripper's interface and exterior finger-molds are 3-D-printed, which means the system will work on virtually any robotic platform." CSAIL is the largest research laboratory at MIT. No meaning to it. Just IGNORE.